BlackBerry shareholders on Tuesday launched a class-action lawsuit against the company, alleging its optimistic sales forecasts for its new smartphones cost them hundreds of millions of dollars, lawyers announced. 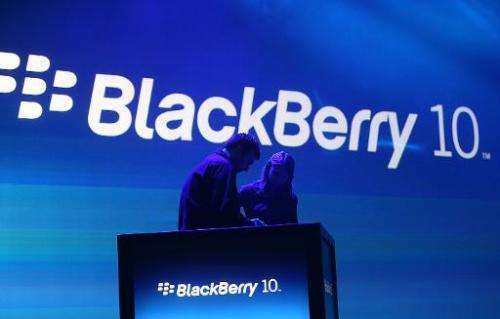 The lawsuit on behalf of Canadian shareholders who purchased BlackBerry stock between September 27, 2012 and September 20 of this year, alleges that senior management "knowingly or negligently" misrepresented that its BlackBerry 10 line of smartphones were being well-received by consumers and that the company was in a strong financial position. The class action is the second launched against BlackBerry in the past week. "For almost a full year, BlackBerry management made market statements based on prophecy rather than fact," class-action lawyer Tony Merchant said in a statement. "Thousands of Canadians who invested in BlackBerry Limited in the past year have lost hundreds of millions of dollars." BlackBerry unveiled its new platform in January as it sought to regain lost momentum, but its most recent numbers suggest this has been a spectacular failure. Last month, the company announced it was laying off 4,500 staff—or one third of its global workforce—after losing $965 million in its last quarter as sales plummeted. BlackBerry's share price meanwhile has slid from a 52-week high of $17.80 in January to below $9 recently.